Repetition is a part of life. Repetition is a part of life. Repetition…OK, you get the point. They say practice makes perfect and the only way to achieve that elusive perfection is to repeat over and over whatever it is you are trying to perfect. The greatest athletes, entertainers and scientists never just stumbled upon their greatness; they worked on it for years. They wanted to make history and become legendary so they dedicated their lives to their craft. When it comes to your teeth and overall oral hygiene, constant brushing won’t make you legendary, but at least you’ll be able to make things like plaque causing bacteria history! Brushing your teeth for at least 2 minutes is an important step toward healthier breath and fresher teeth. Using the right amount of pressure and the proper techniques will help you reach your dental goals quickly. You know how to reach them even faster than that? 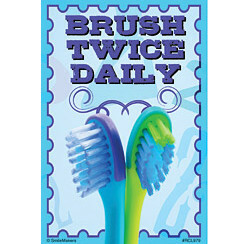 By brushing twice daily. It may seem like a lot of brushing to do in one day, but when you think about it, it really isn’t. Consider the amount of things you put your mouth through on a daily basis: several hot and/or cold beverages, varying foods, talking and biting, etc. You give your mouth a lot of attention for everything else, it deserves the same attention for cleanliness as well. A good brushing when you start your day as a preventative measure, followed by another good brushing before you go to bed to clean off everything the day left behind, is the best way to keep your teeth and gums clean, create an inhospitable environment for plaque causing bacteria and promote the best overall oral health possible.